Cayo Crasqui is an island of the Los Roques national park of Venezuela. The island is located in the South Eastern part of the Caribbean. It is quite near to the Gran Roque island. One can come to Gran Roque by air and then visit the Cayo Crasqui by boat. The boat journey takes only half an hour or less. The place is mostly popular for its extremely beautiful beach. The island is somewhat deserted. 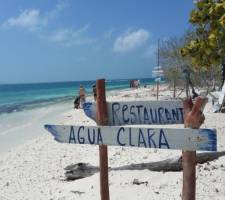 In fact, the only structures in Cayo Crasqui are the fishermen houses; some of which also serve as restaurants. The beautiful natural coral lagoons add to the beauty of this heavenly place. The beach of Cayo Crasqui has an amazing natural environment. The beauty of this place is truly mesmerizing, with birds like Pelicans and various fishes moving near the calm beach side. There are facilities for various water sports too, like bone fishing and kite surfing. The lagoons are wonderful for snorkeling among thousands of fishes. The simply prepared fish and salads, served by the local fishermen dwellings, really go great with the peaceful atmosphere of Crasqui.